As we’ve come to expect from Sonnox, their take on the dynamic equaliser boasts more than a touch of class. The difference between a multiband compressor and a dynamic equaliser is subtle and sometimes misunderstood. Their roles do overlap to some degree, and both work by splitting the signal into multiple frequency bands, but they aren’t identical. Multiband compressors use crossovers with a slope that is usually fixed, even if the crossover frequency is variable, and process each of the resulting frequency bands separately before recombining them, whereas a dynamic EQ applies the gain change directly to the gain parameters of a multiband parametric equaliser. Both designs have their pros and cons. The crossovers used in a multiband compressor can introduce unwanted and audible phase shifts, and a parametric EQ is more ‘tuneable’ than a simple band-splitting system; if necessary, EQ bands can also be made to overlap. A multiband dynamics processor also differs from typical dynamic equalisers in that as the amount of boost or cut increases, the bandwidth remains constant. By contrast, many equalisers exhibit ‘proportional Q’ response, where the bandwidth narrows with increasing gain or attenuation, and this can often sound more natural. Sonnox have incorporated this characteristic into their five-band dynamic EQ, in a design based on their Oxford EQ’s Type Three gain/Q dependency. Sonnox Oxford Dynamic EQ is authorised to a second-generation iLok key and supports Audio Units, VST and AAX Native plug-in formats, and there’s also a UAD2 version. In most respects the GUI follows the typical Sonnox Oxford template and includes a Preset Manager that allows your presets to be called up in any host application. As with most dynamics plug-ins, the point at which gain reduction in each band kicks in is set using a Threshold control. Gain change can take place either side of this band depending on the Trigger mode selected: in Above mode, dynamic gain change takes place when the signal is above the threshold, while in Below mode, the gain change is applied when the signal falls below the threshold. A Dynamics control sets how the gain reacts to changes in signal level once it crosses the threshold, much like the ratio control of a conventional compressor. The response time of the dynamic processing can be adjusted using familiar Attack and Release Controls, and an Output Trim control helps match the dry and processed signal levels. Each band also has an Offset Gain parameter, in effect a static EQ gain setting that is applied when dynamic gain reduction in a band is not being triggered, as well as a Target parameter that limits the amount of dynamic gain change that can be applied in a band. (Where bands overlap, the amount of overall EQ gain change can exceed that set for individual bands.) The Threshold control incorporates a 10dB soft knee so that the transition from Offset Gain to Target gain remains smooth. These settings can be made using either rotary controls or by dragging points in the EQ curve display, where ‘mouse-over’ prompts are available for guidance. When setting up, each band can be soloed or bypassed, and it is possible to process the two sides of a stereo signal equally, the left channel only, the right channel only, the mid signal only or the sides signal only. The EQ types available are low and high shelving or ‘bell’ parametric; all have variable frequency controls, but the Q control is taken out of play in the shelving modes. A zoomable graphic display shows the Offset, Target and dynamic EQ curves while an FFT display tracks the spectrum of the processed signal overlaid on the EQ curve. The side-chain feed includes its own filter which can be high or lowpass, or a single-band parametric EQ, adjustable for gain, frequency and Q, and there’s a Side Chain Listen mode for checking the effect of the filtering. While most applications use the input signal to feed the side-chain, it is also possible to designate an external side-chain source track or live input using your DAW’s usual side-chaining method. The side-chain can be fed from the stereo input signal, or individually from the left, right, mid or sides signal. When setting up the equaliser, the user has the option of selecting how the levels are detected. As expected, Peak mode reacts to peak signal level in a conventional way, while Onsets reacts specifically to sudden increases in signal level regardless of peak level. The designers suggest using Onset detection for dealing with transients, staccato notes and sibilance, and it does indeed seem better suited to these roles than Peak mode. In practice the Oxford Dynamic EQ is very easy to use, and the display shows you exactly what is happening to the gain in each EQ section at all times. I was particularly impressed by just how smooth and natural the results sound, even when a significant amount of EQ is being applied, and I suspect this is due in part to the proportional-Q nature of the parametric sections. In most cases you wouldn’t even know the EQ was being controlled dynamically unless you watched the display. 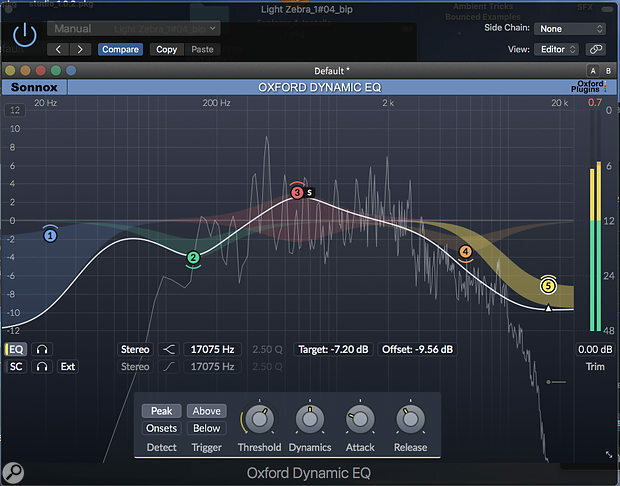 If you have a vocal that just gets a touch harsh on the louder sections, this Dynamic EQ is a useful tool in helping tame it, but it can also work wonders on bass sounds, abrasive guitar sounds, mixes and submixes, pulling back over-dominant elements when they get too loud or lifting out detail that is in danger of being submerged. It is also effective in attenuating narrow-band sibilance and plosives. I’d expect nothing less from Sonnox but this Dynamic EQ really is a serious working tool that combines ease of operation with exceptional sound quality. Most of the serious players produce a dynamic EQ of some sort, and the major alternatives include Waves’ F6, Brainworx’s bx_dynEQ v2 and McDSP’s AE400. A simple-to-use dynamic equaliser that manages to sound transparent even when applying heavy processing.